I’m new to Heartwarming and thought I’d take advantage of this first blog to introduce myself. I’m excited to be a Heartwarming author! I’ve followed the line since its inception and I know quite a few authors writing for the line—including my best writer friend, Rula Sinara—so I feel right at home. Over the past 11 years, I’ve written 22 Superromances and 4 Western Romances for Harlequin. My first Heartwarming, HER MONTANA COWBOY releases in August and it’s set in the same fictional Montana town as my Harlequin Western Romances. As you can imagine, I’m pretty excited for its release. Since this is an introductory post, a little about me. I’m a north Idaho native who moved with her husband to northern Nevada for a one-month geology contract, and ended up staying for thirty years. You know, like people tend to do. While in Nevada, I taught school and lived in a historic ranching community. It was a beautiful place. 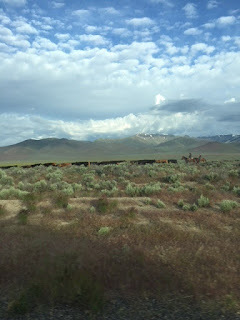 A cattle drive near my house in Nevada. 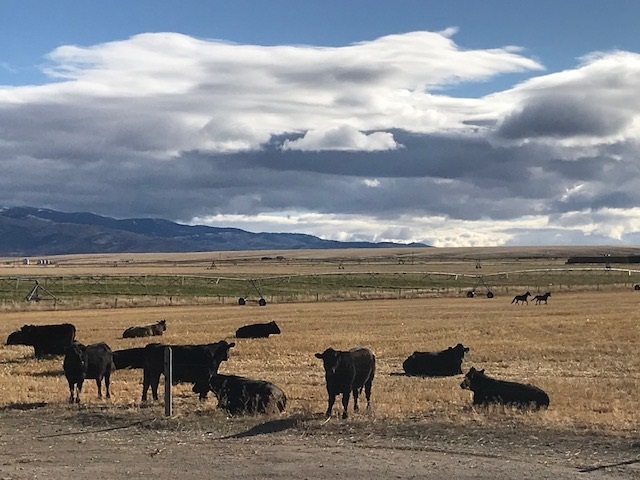 When we retired two years ago, we moved to my parents’ ranch in Montana, bought half of the herd and went into the cattle business. It's been a learning curve. Our friends and neighbors in Nevada were cattle people, but I mainly dealt with horses. I'm getting the hang of handling cattle, though. Important rule number one--respect them. 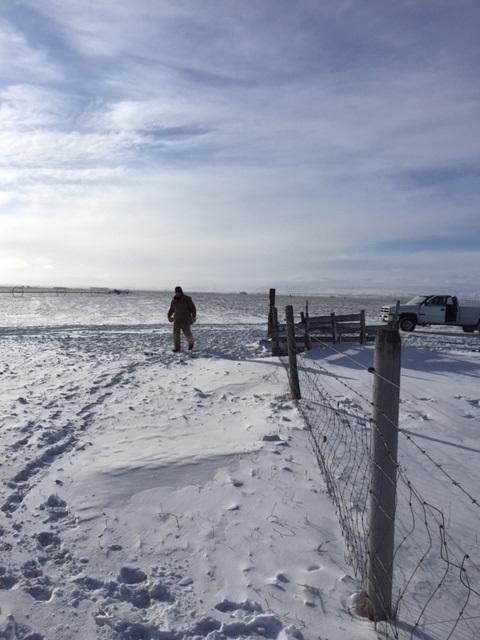 Checking fence in the winter. When I’m not writing, I love to sew. 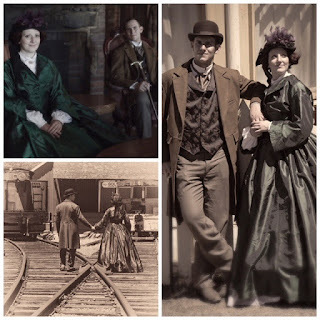 I make Victorian costumes, vintage dresses and whatever else strikes my fancy. These are photos of costumes I made. The only things I didn't make are the cravat and the hats. My husband took the photos in Virginia City, Nevada. He's my in-house photo guy. I’m starting to knit, and, like my editor, Johanna Raisanen, I make glass mosaics. It’s good to keep busy, right? I love watching old movies, 70’s and 80’s detective shows, and I own the entire Perry Mason collection. And that’s me. It’s so good to be here! Congratulations on your upcoming release, Jeannie! Thanks for sharing a little about yourself and life on the ranch. It looks beautiful. Thank you, Jill. It's great to be here! Welcome to Heartwarming Jeannie! I'm a big fan of your Western Romance books and I can't wait to read your August Heartwarming. Cattle ranching up north can be tough! 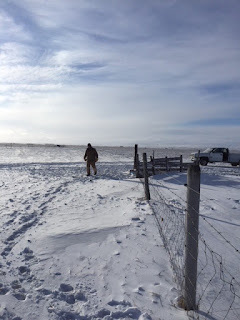 My brother owns a ranch and South Dakota and ranching in the winter is not for the faint of heart! Great stuff for your books though! Yes, it's really good to be able to rely on experience. And if I don't know the answer, my mom usually does. :) South Dakota is a beautiful state and I wouldn't want to ranch in the winter there. I think it's milder where I live. Thanks, LeAnne. Congratulations on your release and welcome to Heartwarming, Jeannie! Your home looks amazing to someone living in urban Ontario and those Victorian costumes are breathtaking. I’d love to hear more about the process some time - where you get the patterns and how long one dress might take. Truly beautiful! So good to have you here. I'd love to make some vintage costumes, but not sure I have the patience anymore. Congratulations on your 1st HW! You're a fascinating--and busy woman. 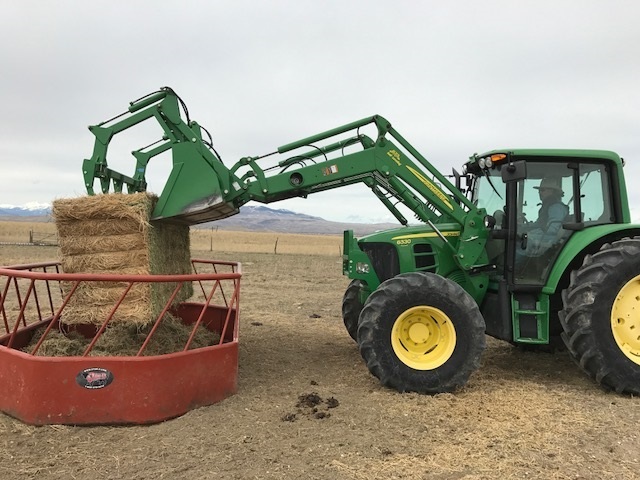 I love how you say you retired to take up ranching in Montana. And your costumes are gorgeous. What do you do with them? Best! Amazingingly, there is a Victorian ball in Virginia City, MT, which is our county seat, but I don't know if I can get my husband to go. He participates in Dicken's Fair with the family every year, far from people he knows, but he doesn't want to dress up in our new community. He's kind of a traditionalist. Jeans, boots, etc. However, my daguhter-in-law is an actress in Reno and she loves costumes, so I have an outlet. And again, Dicken's Fair. So much fun! Welcome, Jeannie. You're a busy woman! Thank you! I get bored easily, lol. Always looking for something new. Everyone, Jeannie really is a multi-talented, amazing woman and writer. You can see from her photos that there's a quality and real feel to her rancher/cowboy romances that comes through the fact that she lives the life. She was my favorite cowboy author long before I sold. And do you still have your sewing website, Jeannie? You had more amazing pics of the costumes you've made. I wish I could sew like that! Rula, you're making me turn red as I read. Thanks you for the kind words. Actually, I've been thinking about reviving my sewing website now that the house is almost finished. The blog has lain dormant for four years, but I miss it. Thank you for welcoming me to the Heartwarming fold! Good to see you here, too, Cathy! Jeannie, as you know I've been reading your books since you wrote for SuperR. I'm so happy to see that you are continuing your work at Heartwarming. You are a true Western Woman. Looking forward to your next book. And you wrote the first Superromance that I ever read! It's good to be with you here at Heartwarming. Jeannie! I have all of the SuperRomancs and Western Romances and I can't wait to add your Heartwarmings to the shelf. Congratulations on moving over to the HW line. I should have said I have all of YOUR Supers and Westerns. Thank you, Marcie. So good to see you here! We've been together a long time! Hi, Jeannie! Those costumes are amazing! So much detail, and that dress must take bolts of fabric. I'm looking forward to your new Heartwarming in August. I lived in Wyoming for six years, so it's always fun to "visit" that part of the country in books. Welcome and congratulations on all your books. Like Rula says, you are multi-talented and have a fascinating life. Loved all the photos, too. Again, welcome! Thank you, Virginia! It's good to be here! Hi Jeannie and welcome to Heartwarming! Congrats on your first HW release. I've been knitting for over fifty years. :-) It one of the most calming activities I do. Looking forward to reading HER MONTANA COWBOY!